Alan began his professional life as a chemist (not a very good one he says!) but he eventually realised that his interest lay in engineering and began the laborious task of re-qualifying for his chosen profession. Transport industries have figured greatly in his background, working for British Railways (for those who can remember those days) and range of materials and automotive companies. Flying came into his life, like many people, when the children were growing up and he could afford to indulge himself! It started with gliders about 20 years ago and although he moved on to powered flight several years later, he says the experience of "reading the air, and always having to do landings without power”, has stood him in good stead. He began powered flying in 1996, training on a C152 at South Warwickshire Flying School. 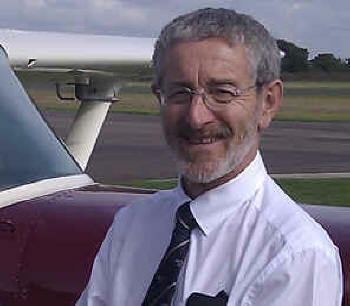 Taking early retirement in 2002 allowed him to "devote himself properly to flying" by qualifying as an instructor, and he has been occupied at Wellesbourne Mountford Aerodrome ever since, teaching on Pipers, Robins and of course the redoubtable Cessna. "It was like coming back home when I had the chance to teach here at my old school, and I'm pleased to say that our School still keeps the right balance of being both a friendly club and a school with high professional standards. It's a real pleasure to be a part of the team".